Are B.Tech Students ready to clear the aptitude test? Great opportunity for your Institute to participate in World Level Championship Event TechnoXian 2017. TechnoXian 2017 is the world’s largest robotics championship event series of International Robotics League (IRL) in affiliation with Ministry of Science & Technology, Govt. of India and All India Council for Robotics & Automation (AICRA). It will accumulate students from all over the world together to be a part of the biggest world level robotics championship and commemorate with knowledge and create an unmatched ambience and aura of learning with fun under the expert guidance of research personnel who have proved their worth in the field of academics and industry. Inviting 3000+ Schools and colleges across India. INR 50.0 Lakhs Award for entire series and certification from Ministry of Science & Technology and AICRA to all. Engaging more than 4.5 million students and developing network to share technical knowledge. 35000+ young participants and 60,000+ visitors. 250+ exhibitors to showcase their products and services. A team of minimum 4 and maximum 20 participants can register themselves for one or more than one following competitions.. Step 1: Institute needs to finalize 5-15 students and 1 mentor (not mandatory) to make a team to represent the institute. Accommodation facility will be provided by our hospitality partner “Oyorooms” you may submit your request online. We welcome you to be a part of TechnoXian community, your journey begins here. Kindly get in touch with us for any support with the undersigned contact. We have couriered the invitation latter as well to your address. We observed that some of the courier has not been delivered and reaching bit late. So we are extending the registration date. Last date for registration is 31st March but subject to team count available. You are requested to register your team asap. Looking forward for your response earliest. 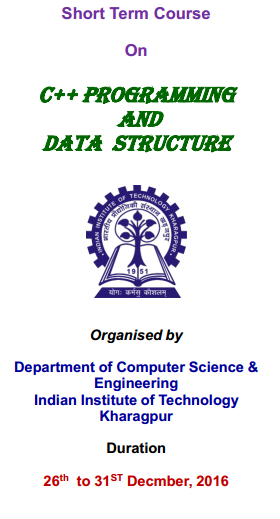 Department of Computer Science & Engineering, INDIAN INSTITUTE OF TECHNOLOGY, Kharagpur has arranged a Short Term Course on“ C++ Programming and Data Structure ” from 26th to 31st December, 2016. 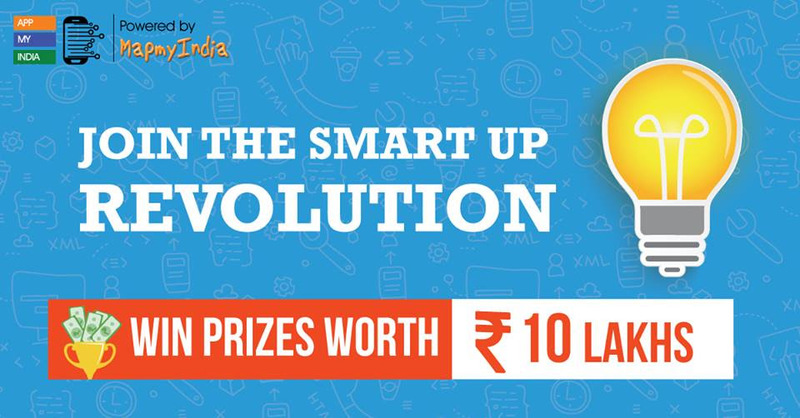 MapmyIndia with GetMyUni invites all students, developers, innovators and creative thinkers to help build a smarter tomorrow through 3 contests (Ideathon, Appathon, Adathon) – aimed at generating innovative ideas, ground breaking apps and marketable ads! AppmyIndia is MapmyIndia’s competitive platform that enables your growth and powers your creativity, business and innovation. Lets come together to brainstorm new opportunities, build revolutionary apps and unveil the prospects of a smarter India. NCAT 2017 presents a unique opportunity for your our institute to become a part of the Pan India creativity aptitude test. The NCAT or National Creativity Aptitude Test has been designed by some of the best brains from IITs & IIMs and aims to make students aware of the importance of creative thinking and to encourage them to use the same for various problem-solving exercises. The next creative genius who is destined to be the Bill Gates or Mark Zuckerberg of India can be among your students and this test will help your students to assess their creative quotient as well as their level of achievement motivation. NCAT will be conducted in two phases. The first round will be conducted in your college and two top performers will be selected from each category to take the second round of test at New Delhi or Bangalore. The 1st round test questions come in the form of multiple choice questions that test a student’s Quantitative Aptitude, Logical Reasoning, and Linguistic Skills. The 2nd round will have a mix of MCQs and subjective questions on creativity followed by an activity on achievement motivation. Category 4: Students of 1st & 2nd Year MBA/M.Sc./MCA/M.Tech. Top Fifteen Performer in each category will get a Residential Certification Course of one week at New Delhi on Creativity and Innovation (Certification from IFEHE). Every student will get a certificate of participation and those with more than 75 percentile will get a certificate of excellence. Creative Institute Award will be given to one of the participating Colleges/Institutes on the basis of maximum number of Students in the top 10 percentile from the College/Institute. The enrollment fee for this test is only Rs. 250 of which Rs. 25 can be retained by the college towards its expenses which includes bank charges, postal charges, and honorarium for the Faculty in-charge etc. For additional details pertaining to the test, visit www.ncat.co.in or contact Ineesh at +91 9810843341, email: info@ncat.co.in.